Hello for the last time everyone! Sadly this is the last time during the school year that I will be writing to you on this blog. I wanted to take a moment to thank you for reading my posts and just taking the time out of your day to look at my blog. You all are truly amazing for allowing me to share my thoughts about these wedding themes and wedding invitations! Today I have for you one last wedding invitation that I would like to talk about, the bright wedding invite. I am not going to say much about this invitation but I wanted to give you an example for the bright wedding theme. The thing that I obsoletely love the most about this the cut out of this on the envelope lip! It matches the flower theme from the wedding and lets you see the inside. This lets the guest get a sneak peek of what inside and what your wedding will be like. Once again, thank you all so much for the support of my blog! I will be posting after I graduate on May 13th, so look for more wedding posts then! When I start up again I want to do a how my wedding planning is going theme. Let me know if this is something that you all would like to have or some different topics that you would like me to write about. I will also be taking suggestions for posts that aren’t relating to my wedding. Have a great start to your summer! This week is my last week posting to all of you awesome people. I hope you enjoy! The week’s theme is very colorful and bright. I wanted to choose this to do something different again because I know you all like fresh and new wedding ideas. I like this theme because it is something that could be used in different seasons. This one is currently in the summer but I could also see it being in the winter or spring. The fact that people can pick out flowers and make there wedding colors that way is a great idea. 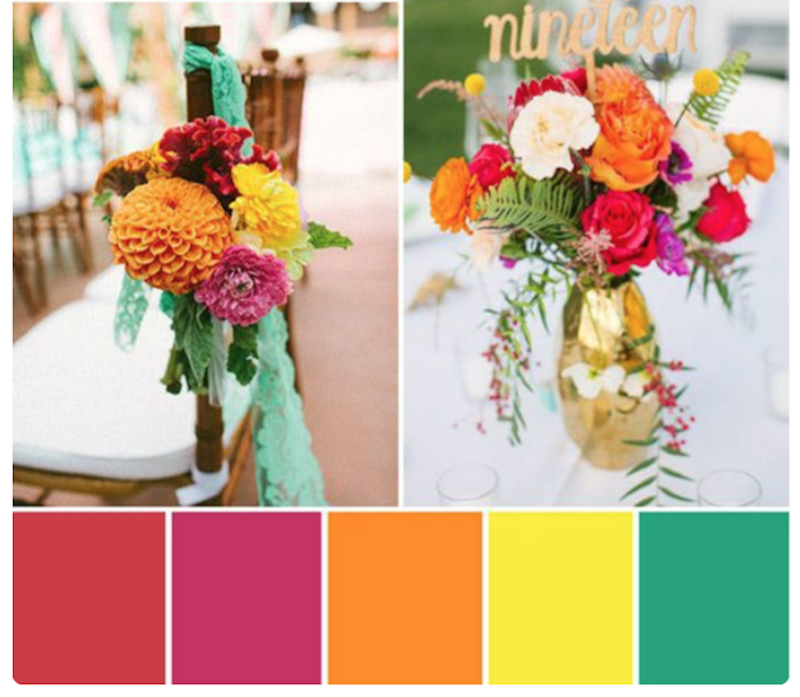 Even though this wedding theme has a lot of colors, it all works well together. There is a good contract between the brighter yellow and the darker orange and reddish colors. I think that pairing the red, magenta, orange, yellow and green with white was a good choice because it helps all of these colors pop even more. I am in love with the lace that is a mint green color on the ends of the chairs. I feel like this lace color is a great-added piece without being too much and too over powering. 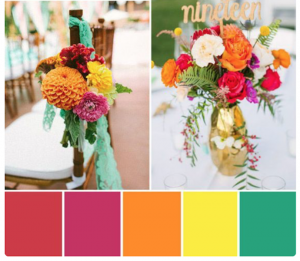 Have you ever been to a wedding that had so many colors before? How did they work together in your opinion? Was it too over powering or did it match the lovely couple well? Thanks for reading everyone! Comments and questions are welcome. I will be posting one last time later this week. Blue and Gold Wedding Invitations! Thanks for coming back to read about the blue and gold wedding invitations! I am going to take about the invitation that is below, I like this invitation because it is so simple and just has the two colors, gold and blue. I love the choice of gold as their type color against the dark blue background. This gives in enough contrast so that the guests can read it but the theme is still clear to the guests as well. This one didn’t picture an envelope but I could see the envelope just being a plan white one or reversing the text and having the text be dark blue and the envelope be a gold color. This next invitation pictured below is very unique, I believe. I see this invitation as unique because of the gold strip that is acting as a holder for all the information that the guest has gotten in the envelope. Another thing that I love about this invitation is that they throw another color that is really light but still noticeable on the invitations. This color is a very light pink. They used the gold color and black for the type but I think it easy enough to read and guest wouldn’t have a hard time looking at the invitations. The last item that I want to point out on this invitation is the blue boarder around the name card. That is an extra piece of paper behind there. However, I believe that it would be worth the cost because it pops out the most important part of the wedding, the bride and her groom. Blue and Golf Wedding Theme! Hello again everyone! I hope everyone had a great weekend and a fabulous Easter if you celebrate that. This weeks theme is more for a winter style wedding I believe but, any bride can have any color on there wedding day! I picked this theme for this week because I love the contrast that is happening between the dark blue and the sparkly gold. For some reason I feel like this theme would do great with a bride that has red/orange hair. Now, there are sparkles in this them, which can be annoying and over powering. However, since the sparkles are used at the right time, they aren’t as obnoxious as some may think. I will not talk about the picture below. The touches of the gold coloring with the plates, chair backs, silverware (or should I say goldwear) and the of the center pieces really adds to not being over powered by the darkness of the blue color. Even in the cake picture below, the cake is so simple with the gold and dark blue coloring but it is the right amount of color. They even have white as one of their colors; I think that is very smart because white is so over looked, just because it is probably the color of the brides dress. Let me know of any comments you have below. Please stay tuned later this week for the invitations of this gold and dark blue theme. I hope you enjoyed reading about this week’s theme! Today we will be going off of the idea of the formal wedding theme and going towards the idea of the invitations for those weddings. As I mentioned in my previous post, this invitation set up and style is more different then we had seen from earlier examples. This example below is from a wedding that went a very simple route. I believe this was a good design decision throughout. This is because this theme is so simple and elegant, the invitations should be too. The flowers are cut out but only some parts of them are and then the rest is a pattern that is put onto the paper. 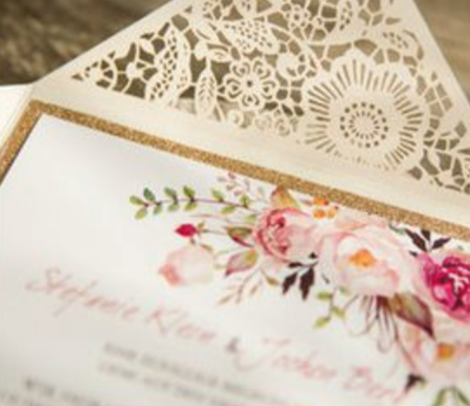 These invitations give the feel of something that is simple and not wild. These formal weddings are meant to be serious and the invitations should convey that to the guest. This invitation is so simple but so powerful. The hierarchy of this invitation is the flowers because the red flowers are a big part of the actually wedding. It is so important to stick with your theme of the wedding from the start. If you want your guests to know what the feel and theme of the wedding is, the only way they will really know that is through the save the dates and invitations that you send out. If you have a specific way that you want your guests to act or you want them to wear something then you have to tell them that instead of them guessing. Have you ever been to a wedding that was formal themed? What theme colors were there? Did the invitation make the theme and feeling clear? Thanks for reading about this week’s formal theme! Stay tuned for more wedding posts next week. This week I am going back to themes! I am going to focus on the theme of red and black colored weddings. I feel like this could be seen as a very formal way of doing a wedding. 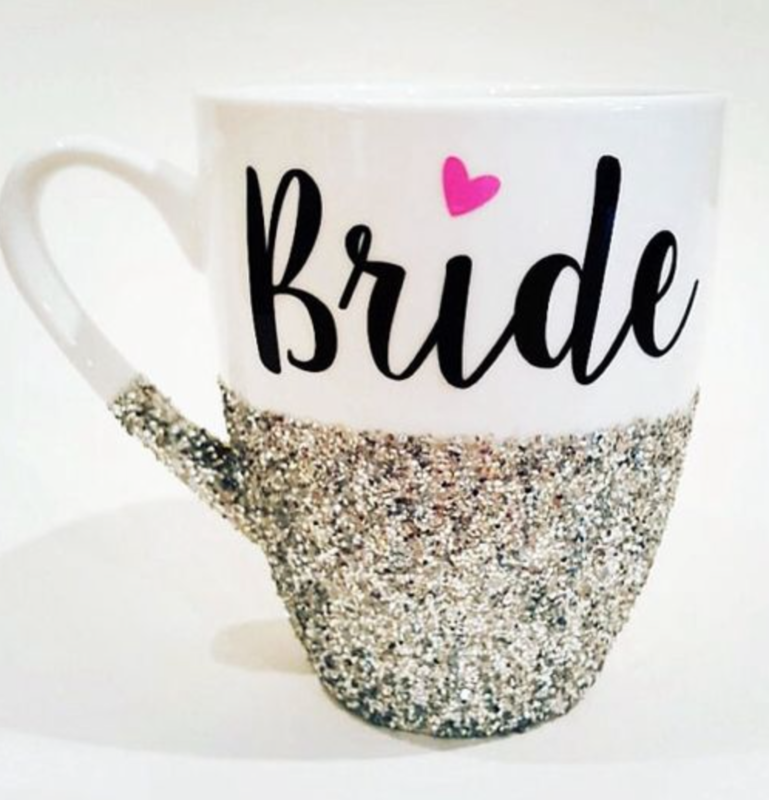 So, this one is for the formal bride to be! This first picture below is one of my favorite examples of a formal black tie wedding with everything from the cake to the brides mate dresses. This theme could be seen as a dark and not as much fun theme. However, a pop of color, like the red is a great way to spice things up and make it a bit more fun. I’m in love with the small pops of color of red in every aspect of this wedding. 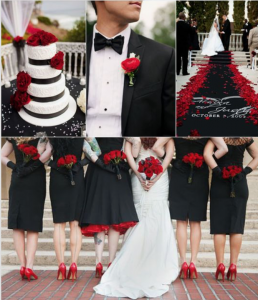 From the few flowers on the cake to the shoes on the brides mates, it all flows together very nicely. This next set of pictures is bring in the formal wedding them a little differently, there is still red though. However, instead of the black everywhere, there is more of white that compliments the red color. Let me know what you thought about this post! Hope you enjoyed it. I would love to hear if you have ever been to a formal wedding before and what you thought of the theme colors and the vibe the wedding gave off. Thank you for reading! Stay tune for more this week with formal wedding invitations and how they are much different from the other invitations I have shared with you. More Of Get Accessorized It Up Week! Today we are going to talk about your flowers, people can spend hundreds of dollars on the flowers for there wedding. They look so beautiful, however then they turn bad the next day and they don’t look so good. I want to be able to keep my flowers and have them forever. You can do artificial flowers but if people don’t want to do that then I am going to give you opition to save your real flowers. This could be used to save your fake flowers too but those wouldn’t go bad that fast. The first option is to put your flowers into these ornaments and or glass balls. These make a great decoration piece that you can put into your home. This will remind you of your wedding day in your everyday life. These are more of a decoration that is personalized but not too personalized. People could have these in their home and guest wouldn’t know that it is flowers from your wedding. 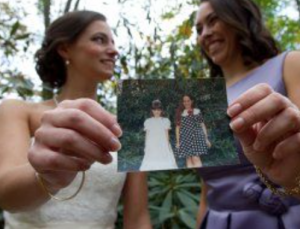 This second option is a shadow box that is more personalized to you and your wedding day. I like this shadow box idea because you can keep your flowers and much more in this display box. To have a picture of the bride and groom, an initial block, the invitation and a few other things that were important for that big day of yours. This will remind you in your home everyday of that best day of your life. Your guest will also be reminded of this special day when they see this. These are two opitions give you a simple way to save your flowers and a more involved way to save your flowers and a few other things from that big day. I hope you enjoyed reading, if you have any questions or ideas please comment! Get Accessorized It Up Week! I am in love with all of the things that you can buy to personalize your wedding. Therefore, this week is going to be all about how to pampered yourself for the big day and have items that you will use after the wedding as well. First of all, who loves coffee or tea?! 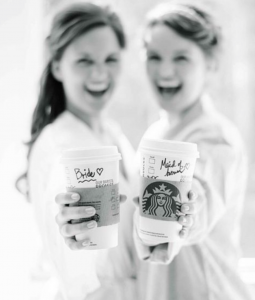 I know I love coffee and these coffee mugs you can use before and after the wedding. It is a coffee mug and how gets rid of coffee mugs? They are just so convenient on those lazy Sundays and Horrible Monday’s that you need coffee. However, items like this can remember you of some special memories. If you really want to make these coffee mugs your own, you can make them yourself. This would allow you to pick of what type you wanted, what format, colors and you could personalize it a lot more then you would be able to with just a store bought one. I have not tried this yet but I have gotten gifts that people have made mugs for me and they are pretty cool. 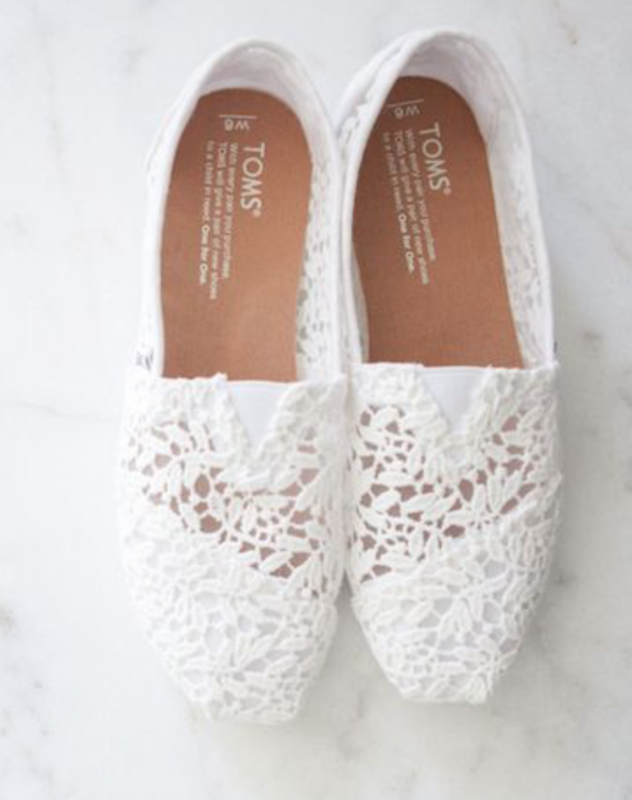 You can wear your shoes any day you want after the wedding, if you do this tip. I would suggest getting flats for your day because then you are not only going to be really comfortable on that day but you can also wear them on your honeymoon and after during your everyday left. Thank you for reading! 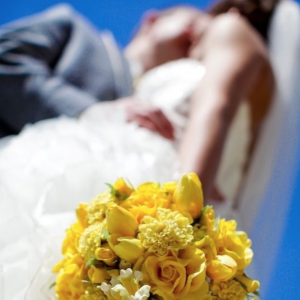 Please share items that you are looking forward to using after your wedding. Stay tuned for a few more items at the end of the week. This post is all about the little details that you will want your photographer to get on camera before you don’t remember them. You are going to have a lot on your mind for the big day and even though you think you will remember everything, you will not remember the things that really made that day yours. 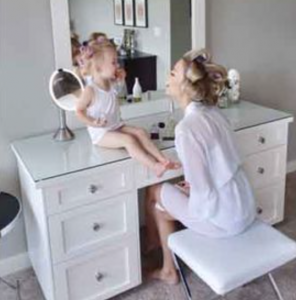 The details are going to start right away in the morning when you get ready. It is so nice to have a photographer come in the morning to do some photos because then you get some before, during and after the wedding photos. This picture below is of this bride’s hair, something like this is a detail that your guest will see but you will not see much of it. When you look back at your day you will want to have a visual of what you looked like. The next photos are some for the morning as well. This are just details that you do not want to miss out on get photos from and having them the rest of your life. With some of those photos, you can share with your kids and they can share with their kids as well. The details are so important, because some of these details will not last forever. 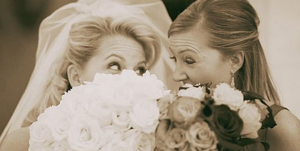 The picture is an example below, having your bouquet be the center of attention for a picture is a great idea. This is because a bouquet is most likely made out of real flowers, which do not last forever but photos do. This last photo is a reminder to be you. 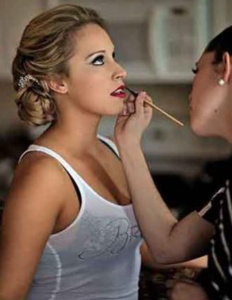 There are most likely a lot of expectations from everyone from your wedding. However, as long as you are happy and you are you, it will be the best day of your life. Thanks for reading! Have a great rest of your week. Hello everyone! I hope you didn’t miss me too much. So no matter what kind of wedding you are having, you have to document the location with lots and lots of photos. This week I am going to share with you some of my favorite photos during the big day that I want to be taken during my big day. I will first share with you some photos to take with your maid of honor. The first photo is of the bride and her maid of honor. I love this one because it really shows their closeness and how they are having fun and laughing. I choose this next one because a maid of honor is usually someone you have known for a while and that you have grown really close to throughout the years. This shows this friendship through a picture of a picture. This next photo I am so excited to take with my maid of honor because it will show how we are getting ready with our hair did and our coffee in the other hand. I say that the more pictures you can get, the better to remember that day. Please take this next photo with the second two most important people in your wedding, your maid of honor and your best man. 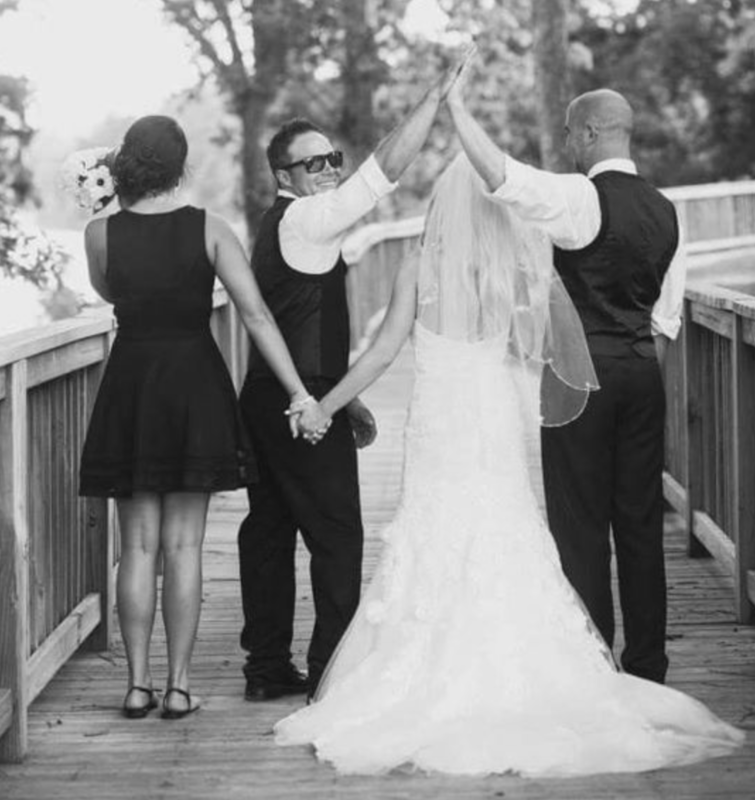 This just shows that friendships are strong even though there is a new married couple in the mix. I hope you enjoyed these photos! I will be sharing more later this week, until then please comment or post your own photos to give some others ideas as well.